Blogging the music, the scene, and the vibe. Follow the blog by e-mail! Last year at Disc Jam, we happened to catch the guys in Fake Flowers Real Dirt doing their thing on stage and we have been fans ever since. This Baltimore band has a sound that blends funk, hip-hop, and groovy throwback jam vibes with soul infusions that keep feet tapping and bodies moving. Their stage presence was fantastic. I have to admit that I have been chomping at the bit a little bit for some new music from them. Naturally then I was THRILLED when I was asked to give a listen and a watch to the band's new politically charged track, "Upside Your Head". Right out of the gate, this track is fire. 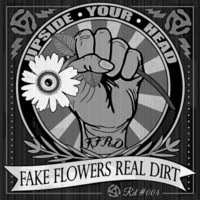 It's got a solid intensity while still maintaining the wicked groove that Fake Flowers Real Dirt does so well. The vibe is awesome and vocal on this track is killer. Listen to the words because it's important! This song is speaking a whole lot of truth for our current conditions. It's my personal opinion (obviously, as is this whole blog) but there are not nearly enough protest songs happening right now, and there should be. This is a scene that loves to brag of it's roots and it's social stance and activism, but given the opportunity to take a stand, there is a lot of should shrugging and "no comment" happening. There are a lot of very prominent bands who don't want to go on record as having an opinion in these charged up and turbulent times. I am absolutely LOVING that Fake Flowers Real Dirt have put their foot down and made their voices heard with this track. The video that accompanies the debut of this song it's super fun. It is a mashup of presidents and other politicians that seem to be grooving and syncing to the words. It brings a bit of lighthearted fun to a serious matter, and it's awesome and very well done. Don't worry, the video is non-partisan (as much as it can be) but the song has an important message about the state of our union that needs your ear. Trust me when I say your body will be moving the whole time, as this song is outstanding. I am hoping this is not the last we hear from Fake Flowers Real Dirt for a while because if this is a taste of what the band has going on, we are in for a damn good time while we work to make changes. It's Almost Time for Disc Jam 2018! - UPDATED WITH SCHEDULE! I can't begin to explain how much I am eagerly awaiting Disc Jam this year. When I found myself really, truly delving into the jam scene, it was for a lot of reasons. I was exploring music I already had a deep love for, I was exploring bands that my husband admired and helped to shape him, I was branching out in my music tastes out of my own curiosity about what I was missing, I was seeking a far more detailed understanding of the players who could go beyond a simple song and instead weave a whole story on the spot, but mostly I was seeking something much deeper for myself. I was seeking a peace that I desperately needed and just wasn't finding anywhere. I'm new to the whole Phish thing. At no point in time did I ever think I would be headed to a Phish show during the Baker's Dozen run at Madison Square Garden. I was that person who made fun of Phish fans. Then I married into the jam scene and my world completely changed. It was gradual. My readers have been beaten over the head with the concept on more than one occasion but to me, honestly is key. I can't write honesty about music unless I tell you honestly how I came to find it. In this case, I had to have my music mind shaken upside down for a few years. I have a tendency to just just completely immerse myself in music that makes me feel. When I come across a sound that has pulled these varieties of feelings out of me, I just want to bathe myself in it until it has made its way into every pore in my body. When I started listening to Giant Panda Guerrilla Dub Squad a few months back, that is exactly what happened. I was so struck by the vibe in their sound. It's not typical. It doesn't feel faked. It's not brooding or overly positive either. It's just hopeful. I was borderline obsessed with how it made me feel. I wrote about it. Music is life, and I write about it. Jam, Funk, Ska, Reggae, Folk, and Indie - I love it all and I want to share it with you! Album reviews, occasional unconventional interviews, shows and festivals, and tacos. Always tacos.